Parallel to the Olivier Breisacher Memorial, a very strong 11-rounds open took place in Biel. 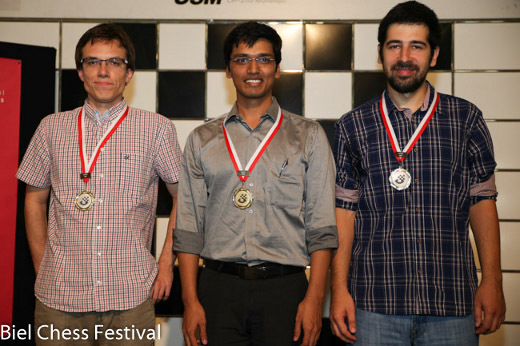 Indian GM Pentala Harikrishna showed a great performance to finish in sole first place with 8.5/11 points. Harikrishna arrived as the second seed with 2680 rating points. Thanks to his strong run at this event, he joined the 2700-club and is now on the 38th position according to the live ratings list. Second place went to GM Mateusz Bartel. The fur-time Polish champion arrived to the last round with the same amount of points as Harikrishna, but was not able to defeat GM Susanto Megaranto, thus getting a final 8/9 score. Two other players obtained 8 points. Turkish GM Dragan Solak got the medal for third place due to his better tiebreak score. Bu Xiangzhi was the player left out of the podium. The first prizes were distributed as follows: CHF 7’000, 5’000, 4’000, 3’000. Daniel Hausrath from Germany obtained a GM norm, and three players gained IM norms: Huang Qian (CHN), Holger Rasch (GER) and Hakimifard Ghazal (IRI). Ghazal also got a WGM norm.